As the old saying goes, “All good things must come to an end”! 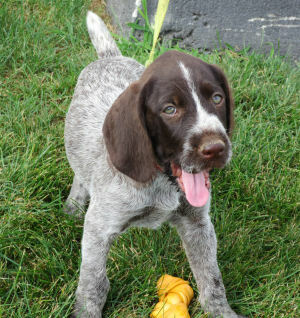 It’s hard for me to say but my old German Shorthair, Cedar, is now 14…that’s pretty old in the bird dog world. I’ve watched these past few months as he has started to really slow down and falter. Frankly, it is very hard for me to see knowing that I started with him at just 49 days old…and here we are coming to a point whereby he, Cedar, really can’t move around like he used to or like he would want to. He and I have had some incredible days afield along the way and he has etched a spot in my memory bank that won’t ever fade…but knowing this and knowing that life is a big circle…my thoughts this past year turned to a new puppy and thus the search began. You might also remember that just a couple years back I lost what thus far was the ‘dog of my lifetime’. Elsie was and will always be one of a kind and losing her suddenly just took some of the pizzazz out of my bird hunting. If you’ve never lost a dog then you may not get it…but for those of you who have, you know and probably understand. But…as I said, this past year I decided that a new puppy was in the cards and started doing my homework and settled on a German Wirehair…not a Shorthair. I have owned 2 Wirehairs before and both were special dogs…so off to the internet I went and put in many late evenings searching and reading, trying to find the right set of parents and a kennel that might have a litter of pups upcoming…so that I could start a puppy this fall. After much searching I finally arrived at Harvest Meadows Kennels in Delta, Ohio. Their website made it clear that they had a litter of pups that were born on July 5of this year…a bit of math and I knew that indeed these pups would be up and around by about Labor Day. No time like the present and I grabbed the phone and called the number posted and quickly was in a phone conversation with Lisa Minnick; owner and operator of Harvest Meadows Sporting Dogs. I liked what I heard immediately and as we discussed puppies, breeding, parents, etc…it was obvious that this was the right place; I got the address, sent off a deposit check and told Lisa that we would stay in touch and see what kind of pick up date we could arrive at. Both boys, Harrison and Jonas…along with Vickie were in the house and listened to our conversation; it didn’t take but a few seconds for them to ask what the new pups name would be? We (probably me) have always named our dogs after little towns in Nebraska. You might quickly ask why…well, it was in Nebraska that I first hunted and fell in love with pheasant hunting and still feel like it is the friendliest state in the union. That being said, I immediately grabbed the atlas that sits by my chair and started thumbing through the many Nebraska communities that I have had the pleasure of following along behind one of the many great bird dogs I have owned over the past 30 years. It didn’t take long…I quickly settled on Pappi; short for Papillion…which is located between Omaha and Lincoln in southeastern Nebraska. Now, if you know your French-then you know that papillion is the French word for butterfly and it is was my hope that my new puppy would be as beautiful as a butterfly! Fast forward to Sunday, September 2 and Vickie and I are in the small community of Napoleon, Ohio. A few miles north and a few miles east and we arrived at Harvest Meadows; finally greet and meet Lisa and with much anticipation turn the corner, there in front of us was a kennel full of 8 beautiful and bubbly German Wirehair puppies. I had earlier sent along a small, red, puppy sized collar and asked Lisa to try and pick out the ‘perfect’ puppy for me…now I say that with a smile because I totally believe that you find the right set of parents, the right kennel owner, then reach in and grab a puppy. Now I must admit that the only real prerequisite that Lisa and I discussed was me wanting the most aggressive male puppy if at all possible. There in the kennel was a gorgeous male wirehair…sporting a red collar; I took that puppy and another male out of the bunch and played with them in the yard for a few minutes…then took a look at Lisa and told her that she had for sure made the right choice. That little guy with a red collar…he was indeed Pappi! We spent another half hour getting all the paperwork completed…then made our way to the car for a 5 hour drive home. I had expected quite a scene with the new pup…imagine you getting torn away from your 7 siblings-how would you feel? To our surprise he whined for a couple minutes, then lay right down and went to sleep for over an hour. The entire trip couldn’t have been better and Pappi took his place among my others, before the day was out he and I got a little training in…I must say that I truly have missed working with a puppy and these next few months (and years) are suddenly full of high hopes. So…if you see me out with a new buddy-you’ll know who my little addition is. I plan on doing a few other columns along the way as me and Pappi train each other….so, please stay tuned! 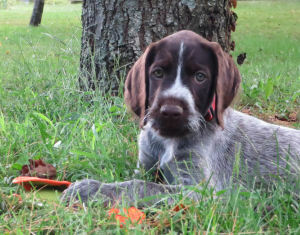 While Elsie and Cedar will always have a special place in my heart…there is just something cathartic about a new bird dog puppy. Nature is kind of that way…it occasionally reigns us in so that things which shouldn’t be mundane….well, aren’t! The next few months will once again have a bit more significance as me and my brood of bird dogs chase game…all while Enjoying the Great Outdoors.